Study Design: The 34 patients were enrolled after being admitted to the University Hospital of Munich, Germany for documented torsades de pointes (TdPs) in the context of a drug with QT-prolonging potential: sotalol, sumatriptan, amiodarone, bisacodyl, cipramil, furosemide, clarithromycin, erythromycin, roxythromicin. The patients were enrolled for an evaluation of the individual level of repolarization reserve, all patients have signed informed consent to receive doses of sotalol. They were all genetically tested for presence of mutation of the major LQTS genes using standard genotyping techniques (genomic DNA was prepared from lymphocytes, amplification of KCNQ1, KCNH2, KCNE1, KCNE2 and SCN5A using polymerase chain reactions were performed, followed by direct sequencing of these major LQT-disease genes). The control group consisted of patients who were started on sotalol for prevention of paroxysmal atrial fibrillation and had given informed consent to enter the study. The study protocol is described in the article published in 2003 by Kaab et al.. Briefly, dl-sotalol was given intravenously at a constant rate over a 20 minute interval at a dose of 2mg/kg body weight in 50ml of 0.9% saline solution in a group of individuals with (+TdP) and without history of drug-induced TdPs (-TdPs). Tests were performed in the morning. Sotalol was injected to unmask latent repolarization abnormalities while patients were closely and continuously monitored in the intensive care unit. 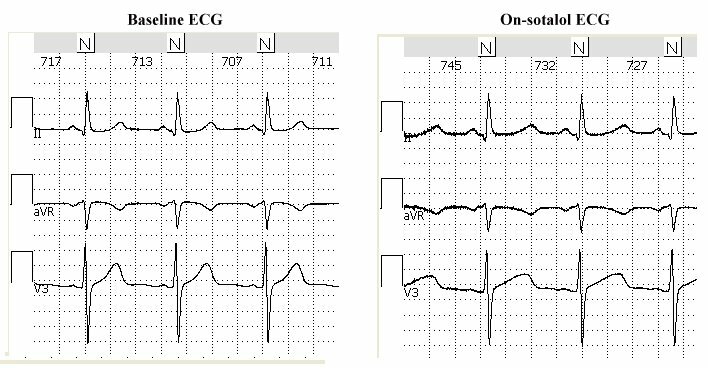 Continuous 3 to 4-minute surface 12-lead ECG recordings were acquired at rest in supine position at baseline and at 20-min steady state phase after injection. The THEW database includes 2 ECG tracings per patients at baseline and on peak concentration of the drug. File Naming Convention: Each filename is composed by "ECG-PXX-0X" where "ECG-PXX" indentifies the patients id and "-0X" the ECG number. For instace, ECG_P05-02 is the second ("-02") ECG file from patient 5 ("ECG-P05"). The clinical characteristics of the study population are provided in Table below. The average ages of the populations were not significantly different between the two groups: 5913 yrs vs. 6112 yrs. The number of females is slightly higher (N=12) in the group of individuals without TdPs than in the group with (N=9). Presence of history of myocardial infarction, coronary artery disease and hypertension were similar between the study groups. There were several patients with history of AF in both groups (+TdPs: N=11 and -TdPs: N=17, p<0.05). One of the patients had atrial fibrillation during the ECG recording. This ECG was removed from the analysis resulting in a group of 16 patients with a history of TdPs and 17 individuals free of such history. The group of individuals with a history of drug-induced TdPs has been reported using a heterogeneous list of medications. None of the patients of the study experienced episodes of TdPs during the sotalol challenge and none of them were carrying mutation linked to the major congenital forms of the LQTS. Clinical Information: A limited list of clinical information for these patients is described in the following table. The complete list of clinical information includes: history of Afib, presence of coronary artery disease, presence of myocardial infarction, history of hypertension, ejection fraction, hypokalemia. Couderc JP, Kaab S, Hinterseer M, McNitt S, Xia X, Fossa A et al. Baseline values and sotalol-induced changes of ventricular repolarization duration, heterogeneity, and instability in patients with a history of drug-induced torsades de pointes. J Clin Pharmacol 2009; 49(1):6-16.